It was no accident that Barack Obama chose Ghana for his first presidential trip to Africa: for him, it was a way of paying homage to his illustrious predecessors while officially proclaiming an end to black America’s longstanding fantasy of a return to the native country. As the first black African nation to free itself from the British yoke in 1957, the former Gold Coast became a symbol of emancipation for blacks throughout the world and African-Americans, in particular. For a black America that had just begun its struggle to win recognition for its rights, Kwame NKrumah, the father of Ghanaian independence and a hero of Pan-Africanism, offered a ray of hope and a justification for their struggle, showing that black people could indeed defeat their oppressors. NKrumah, who had attended Pennsylvania’s Lincoln University, very quickly understood the power that a “black international” could have on the other side of the Atlantic. 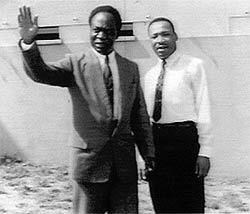 His example immediately reverberated in the United States: at his church in Montgomery, the young pastor Martin Luther King, Jr. bombastically welcomed the birth of the Ghanaian nation, comparing NKrumah to Moses and identifying the American struggle for civil rights with the victorious, anti-colonial struggle of the newly emancipated Ghanaians. Indeed, Obama’s address recalled this 1957 speech, evoking the great hopes inspired by Ghana at the time. Those hopes, it was clear, remain unfulfilled. Yet Obama’s dispassionate speech seemed to suggest that Africans were not the only ones who might draw lessons from this. Indeed, with his usual practice of using insinuations and addressing different audiences simultaneously, Barack Obama expressed (without saying as much) what each black American knows very well: that Ghana is a broken dream for African-Americans themselves. Since its creation, Ghana has represented a utopia for black Americans, which no doubt explains the President’s choice of this country for his first official visit. A patch of black land across the seas, it was also a little Afro-American protectorate, in the way that Omaha Beach is an extraterritorial region. However, precisely because he is African-American, the new President intended to do away with this chimera once and for all. He was thus careful not to quote the end of Dr. King’s discourse, where the latter called upon his followers to leave for Ghana in order to contribute the aid necessary to the sister country’s development. Though he visited the “Door of No Return,” an indisputably important memorial of slavery, Obama barely visited the tomb of W.E.B. Dubois, a revered leader of the black cause who, disgusted with America, in the early nineteen-sixties decided to move to Ghana, where he lived out the remainder of his days. Tens of thousands of African-Americans were to travel to this new promised land in their turn, from Malcolm X, Richard Wright, Maya Angelou and Muhammad Ali to such prestigious contemporary academics as Henry Louis Gates, Kwame Appiah and Sadiya Hartman. Some stayed, many returned. With a bitter laugh, Gates recalls how, after arriving in Ghana, the new pilgrims threw their American passports into the sea in a “return to the motherland” ceremony. Fifteen days later, these same pilgrims were caught dredging the sand in order to retrieve the document, indispensable for returning to the United States. For the pan-African mirage of returning to the roots has run out of steam: the socialist model of development dear to Du Bois gave way to the corruption and authoritarianism of NKrumah. Black Americans were not welcomed as brothers but as “obruni” (white foreigners) who had come to lecture Ghanaians on the meaning of black identity, which for them consisted of Ashanti legends and the trauma of deportation . Their hosts, for their part, dreamt of making the opposite voyage and, each year, hordes of them press against the gates of the American Embassy in Accra in the hope of emigrating to the United States. To Ghanaians, the desire to “return” on the part of these distant cousins from the Diaspora seems more than a little odd. Yet Ghana and, first and foremost, its Ministry of Tourism have tirelessly presented the country as a new Israel for American blacks, selling all-inclusive “return to the roots” tours which have met with great success in the streets of Chicago and Philadelphia . Since the time of Du Bois, who famously became a naturalized citizen of Ghana, American blacks have been able to obtain a Ghanaian passport in no time at all. In addition to organized tours of the principal sites of the slave trade, which have been restored and adapted for their benefit (to the great displeasure of those who bemoan the Disneyfication of these sites of death , tourists in search of their stolen memory can now also participate in “ancestral” ceremonies before heading to the gift shop. In recent years, this “return trip” has had greater success than at any point since the 1920s, when black nationalist activist Marcus Garvey called upon his followers to “go back” to Africa and created his own line of transatlantic ships for this purpose. 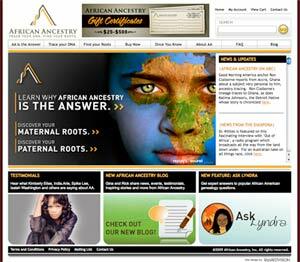 Indeed, with the democratization of DNA tests promising to genetically identify the African stock from which black Americans have descended (opportunely responding to the search for memory among many of them), tens of thousands of Afro-Americans have “rediscovered” their African identities. Although the scientific validity of such tests (which are very profitable for these media savvy laboratories) has been challenged , there are many who believe they have thereby recovered their despoiled identities. The genetic illusion thus reinforces the political myth. Americans living there since the 1960s or those who tried the experience of expatriation cannot help but recognize that they acted under an illusion: they are not (or are no longer) Africans and something more than just the Atlantic Ocean separates “the motherland” from their place of birth. Ghana thus leaves black Americans with a bitter taste. This perhaps explains Barack Obama’s enigmatic remark that he was pleased to have his daughters visit the slave trading ports for the same reasons that he was pleased they had visited Europe’s concentration camps. Martin Luther King had understood this and warned African-Americans. “We are not Africans”, he said, and the Promised Land, our land, is here. The illusion has run its course. Obama called on American blacks and Africans alike to awaken from their obsolete dreams. Far from offering America’s help, as King had done, he proclaimed an end to the days in which serious mistakes were glossed over in the name of peace, calling upon Africa to henceforth take charge of its own destiny. Founded in 1822 by American ex-slaves who had “returned” to Africa to create an Eldorado and land of liberty, Liberia was characterized by a similar experience. For Africans, this population transplant was experienced as colonization and as such was a failure. On June 11th, “Envoyé Spécial” ([France 2 http://blog.capatv.com/2009/05/des-etats-unis-au-ghana-%e2%80%a6-retour-aux-sources-un-reportage-de-marc-garmirian-le-jeudi-11-juin-a-20h35-dans-envoye-special-sur-france-2/]) devoted a remakable report on the subject by Marc Garmirian entitled “Des Etats-Unis au Ghana, …retour aux sources”. One of Michael Jackson’s brothers thus proposed a very controversial idea for a slavery tourist park. See the article in theGuardian.